Boat Rental on Lake Simcoe | Lake Simcoe Marine Ltd.
Want to enjoy the water this summer with your family, but don't own your own boat? No worries...We've got you covered. From fishing with the buddies to relaxing on the water in a pontoon with the Family, we can have you enjoying your day hassle free. 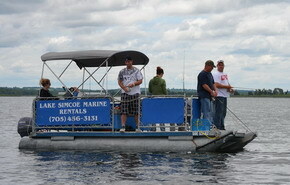 We provide the boat, safety equipment, expert advice and memories to last a life time. All you need to bring are the smiles. Avoid Disappointment... Reserve In Advance! A refundable damage deposit is required at time of rental. The vessel will be inspected prior to the rental period and re inspected upon return. Any loss or damage incurred is the responsibility of the renter. 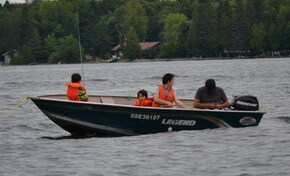 ALL RENTAL BOATS MUST BE BACK AT THE DOCKS BY 5:00 PM OR A LATE FEE WILL APPLY. $50.00 charge will be charged to you if you cancel within the 48 Hrs of your reservation. The full amount of your boat rental will be charged to your credit card if you fail to cancel your rental and fail to show up for your rental on the day of. No Alcohol or BBQ's allowed on board any rental boat.